Have you ever wondered how old those eggs in your refrigerator are? You can quickly and easily test eggs for freshness, and never wonder again! We go through eggs pretty quickly in our house, but every once in a while I’ll end up with an egg carton at the back of the refrigerator. And I don’t always know how long it’s been there. If you end up with stray eggs in your refrigerator (and you should always store eggs in your refrigerator), you can check the pack date or the sell by date on the carton to see how old they are. But what if you moved your eggs into a different container? What if you can’t read the dates on the carton? Then what? Then just get out a glass of water and see what happens. When the eggs are just a few days old, the air pocket is very small and the egg will lay down on its side at the bottom of the water (the 11 day old egg, on the right of the photo below). I bought that egg on September 28. It had been packed on day 261, or September 17. So that egg got from the farm to the grocery store and into my refrigerator in only 11 days. The sell by date is October 16, still 3 weeks away. As the air pocket gets bigger, and the egg gets older, it will start to lift up off the bottom of the water. 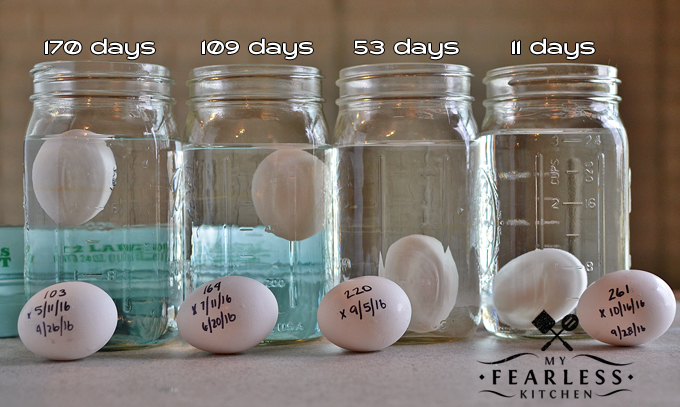 In the photo above, the egg that is 53 days old is still on the bottom of the jar, but it is upright instead of laying flat. The older the egg is, the larger the air pocket will be, and the higher it will float. The 170 day old egg on the left side of the photo is floating with the top sticking out of the water. In the photo below, you can see how far out of the water the eggs will float. The 109 day old egg has less sticking out of the water than the 170 day old egg. This float test will tell you approximately how fresh (or how old) your eggs are. But it does not tell you if your eggs are safe to eat, or if they are still good. A good rule of thumb is that eggs will last for 4-5 weeks past their pack date. If they are stored correctly, eggs typically don’t spoil for a long time. But as that air pocket gets larger, the egg inside the shell can dry up. Click here to download your free printable cheat sheet to keep in your kitchen! If you aren’t sure how your eggs have been stored or if they are still good, it is best to throw them away. Food poisoning can be awful, and it’s much better to prevent illness than suffer through it. What’s your favorite way to enjoy eggs? What Does the Code on the Egg Carton Mean? Good to know. Thank you Marybeth. So do you think the egg that is still on the bottom but standing up is still good to eat? Eggs are still safe to eat for 1-2 weeks past the expiration or sell by date on the carton. That date needs to be 30 days (or less) from the date the egg was packed. So that means that you have around 44 days from the pack date. The egg that is on the bottom of the jar but standing on its end is 53 days old. I would probably still eat that egg, but would be sure to cook it thoroughly (no sunny-side up or over easy for this one). The “float test” does not tell you if the egg is still safe to eat – if you see any of the things in the bulleted list in this article (bad smell, off color, etc), then the egg should be thrown away.